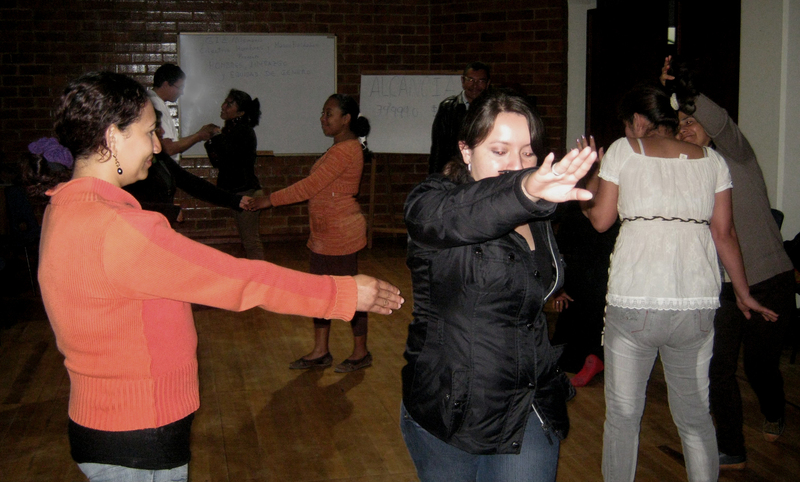 Invited by the German Development Cooperation, GIZ, Hector returned to Colombia in May and offered theater workshops. He offered his skills to facilitate dialogue amongst leaders of the diverse organizations of Colombia’s Internally Displaced (ID) population. There are over 5 million people that have been Internally Displaced in Colombia, the largest population in the world, over Sudan and Iraq. Hector offered his methodologies to process gender issues, leadership challenges, and the many murders and death threats suffered by this most vulnerable population. This trip marked Hector’s second venture back to Colombia to work with local organizers for human rights, peace and justice. ImaginAction is seeking more funding to be able to continue this imperative work, so please click here to make a contribution! Diane Lefer joined Hector at the First International Theater Festival for Peace in Barrancabermeja, La Carpa de La Paz, where they offered theater and writing workshops. Diane wrote two lucid, informative and moving articles about the experience: this one for the website New.Clear.Vision and this one for LA Progressive. For the many of us who couldn’t make it to Barrancabermeja, the articles are a quick & inexpensive trip there and back. Enjoy!